Stocks in the coming week are about to turn in their worst annual performance since the financial crisis a decade ago. The market also confronts the Fed, one of its biggest worries, in the first week of the new year, when Fed Chairman Jerome Powell joins a panel with former Fed chairs Janet Yellen and Ben Bernanke at an economics conference Friday. The bond market is pricing out Fed rate hikes, and that could help stocks if Powell is dovish. Federal Reserve Board Chairman Jerome Powell speaks during his news conference after a Federal Open Market Committee meeting in Washington, December 19, 2018. 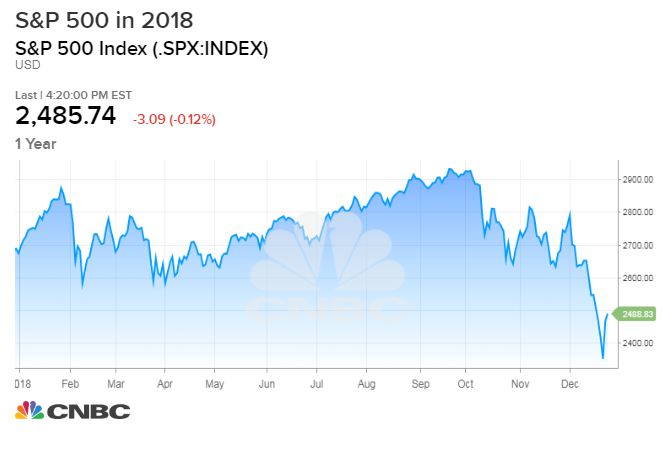 Investors can bid farewell to the worst year for stocks in a decade, but they may not find a way to escape the volatility when the new year starts with a bang. By the first Friday of 2019, it's back to business in a big way with the December jobs report and an unprecedented panel of Federal Reserve leadership. Fed Chairman Jerome Powell sits down with former fed chairs Janet Yellen and Ben Bernanke at an economics conference Friday morning. Since the Fed is one of the major worries for the market, Powell's comments could change the tone for investors very quickly. Powell jolted markets after his last post-meeting briefing Dec. 19, when he said the Fed's balance sheet roll-off was on "autopilot," a surprise to those who expected more flexibility from the Fed, given worsening financial conditions and recession fears. The December employment report Friday morning is expected to show 180,000 jobs were created, up from 155,000 in November, according to Thompson Reuters. Wages are expected to grow by about 3 percent year-on-year, and the unemployment rate is expected to hold steady at 3.7 percent. But first, stocks will exit 2018, and their final performance for the year Monday could be anyone's guess after the massive intraday volatility of the past week. The Dow had its best day ever, with a more than 1,000 point gain Wednesday, following its worst Christmas Eve wipeout ever, with a loss of more than 600 Dow points in a half-day session. "I think if we didn't see the low, we saw something pretty close to it. I think it's okay to start buying on weak days ... on days when it's rallying hard, maybe just stand pat," said Jim Paulsen, chief investment strategist at Leuthold Group. "That's what I would be looking at doing. I think sometime in 2019 if you buy down here in this area, you'll probably be happy." Stocks were up across the board in the past week. The S&P 500 rose 2.9 percent to end at 2,485 Friday, and the Dow was up 2.7 percent at 23,062. 2018 was a year of surprises, with a sell-off in the fourth quarter that was not expected by Wall Street forecasters. For the month of December, the S&P was off more than 10 percent and the year-to-date decline was about 7 percent, the worst performance since 2008. "It's a weird thing to have this happen in the holiday season. I don't know what that means. Does it make it more like it's a false dive ... or is it more signaling? I don't know. I can't find another period like this," said Paulsen. The strategist said he's now recommending buying dips again, a strategy that was abandoned by investors as stocks slumped in December. "You're going to see ups and downs now at least for awhile. I don't think it's going to be months, but for the next couple of weeks, it's going to be volatile. It's still weird to see that happening at one of the best months of the year when players aren't around," said Paulsen. As stocks moved both higher and lower Friday, Treasury yields, which move opposite price, were mostly lower. The 2-year yield slid to 2.55 percent, while the 10-year was at 2.71 percent. "[The bond market] is discounting the idea the Fed is going to continue raising rates," said Andrew Brenner of National Alliance. "The first opportunity you have to see whether they're right or wrong is next Friday, when Powell gives a major speech on the economy." Powell is attending the American Economic Association and Allied Science Association Meeting in Atlanta and will appear on the panel with Bernanke and Yellen at 10 a.m. ET. Brenner said he expects January to be a rough month for stocks. ""What could change that is Powell, depending on what he says next Friday," said Brenner. "He could turn that on a dime. ... I think January, unless the Fed really blinks hard, is going to be a very bad month." Brenner said fund reallocation could continue to have an important influence on the market Monday, after stocks saw a big impact in the past week as pension funds and others bought equities to rebalance their holdings by the end of December. "This is real money. These guys don't care what's going on in the market. They have a formula that says they have to be at X percent equities, X percent fixed income," he said. Wells Fargo estimated that pensions could have to buy as much as $64 billion in equities into year-end. After Monday, markets are closed until Wednesday morning for the New Year's holiday. Typically, the first couple of days of the new year are positive. "It should be less wild, but that depends on the news — if you get any White House tweets and stuff like that," said Art Cashin, UBS director of floor operations. "According to the old timers' handbook, the first couple of days should be higher because of new money for the new year, but this has been wacky." Markets will also be watching developments in the continuing government shutdown and on the trade negotiations with China, expected to start up again in January.